Quartz, also known as an engineered stone surface, is a common material used for beautiful countertops. Cambria and Zodiaq are some common, well-known brands. Variations in the color, shade, pattern, and shape are natural and won’t affect the performance of your Quartz countertops. Learning how to care and maintain your surface is very straightforward. The material is more resistant to surface damage than comparable stone materials. It’s stain-resistant, chemical-resistant, non-porous, and tough, making it a great option for commercial and residential kitchens when high-performance and natural aesthetics is a must. To maintain the stunning, lustrous appearance of your Quartz countertop, simply use water and a damp cotton cloth for routine care. You can use a soft cleaner if necessary, just avoid bleach and abrasive cleaners. Quartz surfaces resist permanent stains from fruits, vegetables, and liquids such as wine, tea, vinegar, soda pop, and lemon juice. If a spill occurs, wipe it up right away before it has a chance to dry. If the spill has dried, try using a Scotch-Brite®* scrub pad with a little cleaning product like Formula 409® Glass & Surface Cleaner**. Avoid these substances to keep your surface looking new and vibrant. If any of them do contact your countertop, rinse immediately with water and wipe dry. Quartz countertops are resistant to scratches, but they aren’t scratch-proof. Don’t cut, chop, or slice food directly on the countertop; always use a cutting board instead. Although Quartz surfaces are chip-resistant, they aren’t chip-proof. You can avoid chipping by taking extra caution around the corners of the countertop, especially around sinks and dishwashers. Multi-colored surfaces hide chips more than monotone designs. 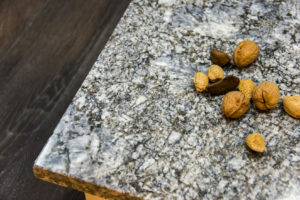 Keep in mind your Quartz countertop is nonporous, so it doesn’t require waxes or sealants to keep its luscious gloss and ultra-smooth surface. Avoid concentrated bleach and cleaners that contain bleach. If you’re not sure if a cleaner contains bleach, check with the manufacturer or the instructions. Avoid high pH cleaners as much as possible. Brief exposure to alkaline solutions like diluted bleach won’t damage your Quartz countertop, but we recommend avoiding high alkaline cleaners like oven cleaners and concentrated bleach. If your countertop contacts cooking grease, use a degreasing product like Greased Lightning™*** to clean the surface. Follow the instructions on the back of the bottle. Avoid using permanent inks and markers around your countertop. If the ink comes in contact with your Quartz surface, follow the routine care steps mentioned above. If that doesn’t work, use Goo Gone®**** or a similar cleaning product on a dry cloth and rub it into the stain. Rinse the surface with warm water. Make sure to keep solvents and powerful chemicals away from your Quartz countertops. This includes paint removers, furniture strippers that contain trichloroethane or methylene chloride, nail polish remover, bluing, and oil soaps. Although Quartz surfaces are resistant to heat, they’re not invincible. Always use trivets or hot mats when you remove hot items from the oven and need to set them down. Avoid heat-generating items such as griddles, frying pans, crockpots, roaster ovens, and heat lamps. Some tougher substances harden as they dry, such as gum, some foods, grease, nail polish, and paint. You can gently scrape these tougher materials away with a plastic putty knife. If you have any questions about how to care for your engineered stone surface and maintain its lustrous shine, don’t hesitate to contact us. ** Formula 409® Glass & Surface Cleaner is a registered trademark of the Clorox Company. *** Greased Lightning™ is a registered trademark of the Chemtura Corporation. **** Goo Gone® is a registered trademark of Goo Gone®.